Annyong. Lindsay, Mom, Dad, and Whit here sitting four-wide on our floor-level sofa. We’re finally thawing out after a day spent in the snow in the nearby town of Damyang. It’s a 30-minute bus ride to this town known for its bamboo. When we looked out our window this morning to see at least a foot of snow (says Mom) we were hesitant about spending the day out in the arctic. It hasn’t stopped snowing yet! But we certainly didn’t want to spend the day indoors in our small apartment so we put on our longjohns, rainboots, two pairs of socks, hats, sca rves and mittens and headed out. After Mom sloshed around in a few frozen puddles in her tennis shoes, we were off in search of some decent boots. We found just the pair, which makes her look like a stylish Korean woman. And then we caught the bus to Damyang. 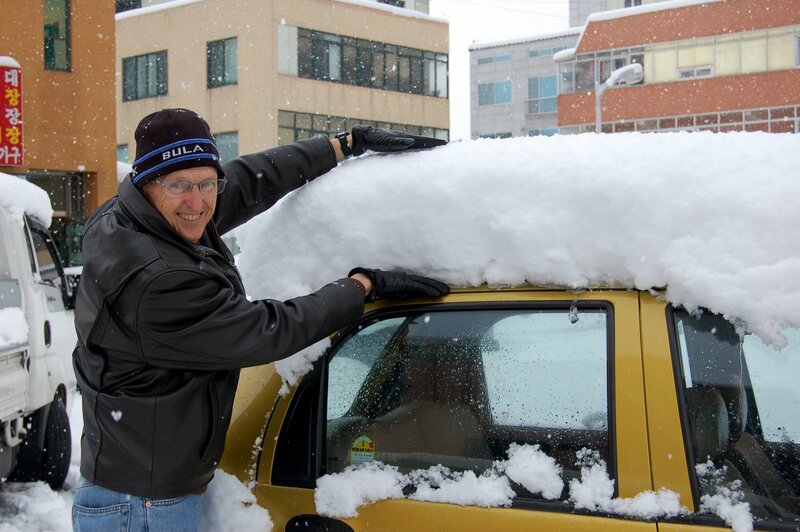 We can’t believe how much snow we have gotten, and it hasn’t stopped yet! Mom and I think the last time we saw this much white stuff was that infamous Blizzard of ’93 when Mom burned a ho le in our carpet with a firelog and then got bit by a dog as she sledded down the hill. Oh, memories. 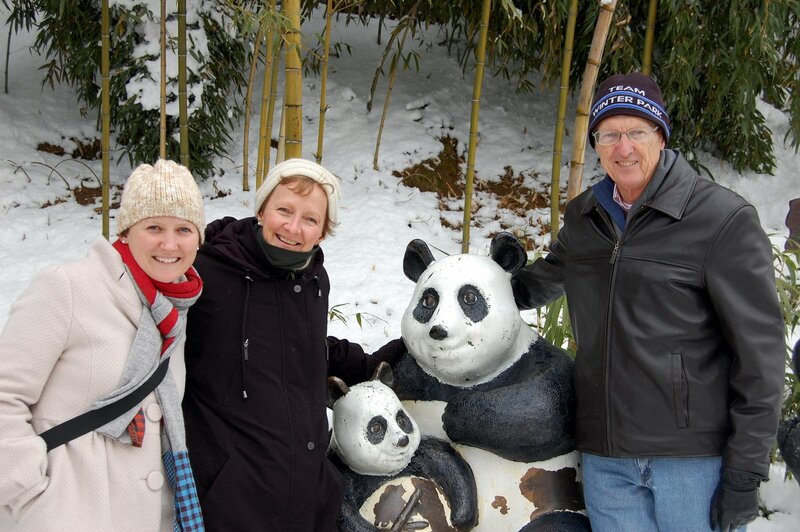 We had a great time at the bamboo forest despite the frosty weather. 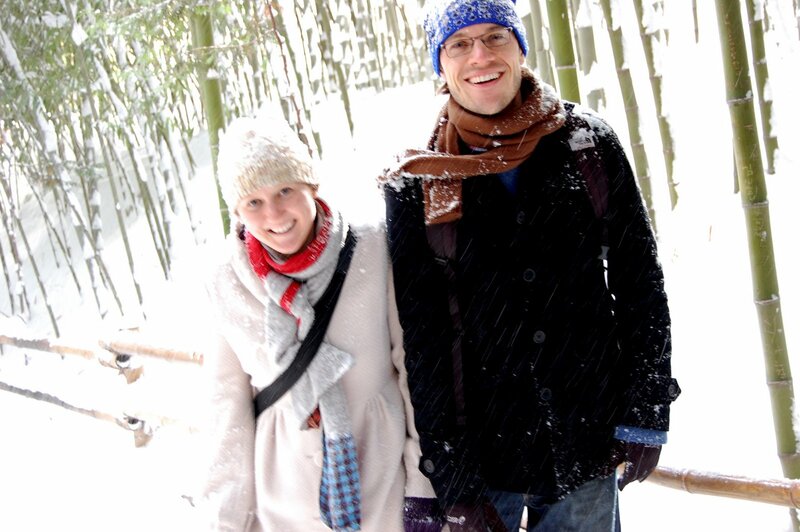 The snow on the bamboo trees was really beautiful. Dad was so excited that he decided to hop up onto a (frozen) pagoda, where he immediately flopped around like a fish out of water before he landed horizontally, knocking the breath out of him. We laughed after we found out he was OK. I hadn’t heard Whit laugh that hard in awhile! No worries, Dad is fine, though he says it will probably hurt worse tomorrow. He still thinks that Whit and I are trying to “off” them while they are here with all the hiking up frozen ice-covered mountains, spicy food, blizzard weather, scary taxi rides and now, the icy pagoda. But I, the dutiful daughter, reminded him of the theory of frozen ice. Just like those signs always say: CAUTION. Bridge will ice before road. Just to prove we are not trying to kill them, we are eating Western food tonight. Or rather, Italian food. Whit is cooking up some spaghetti on the stove right now. We’re just hoping he’s not going to sneak in any of those pig heads. 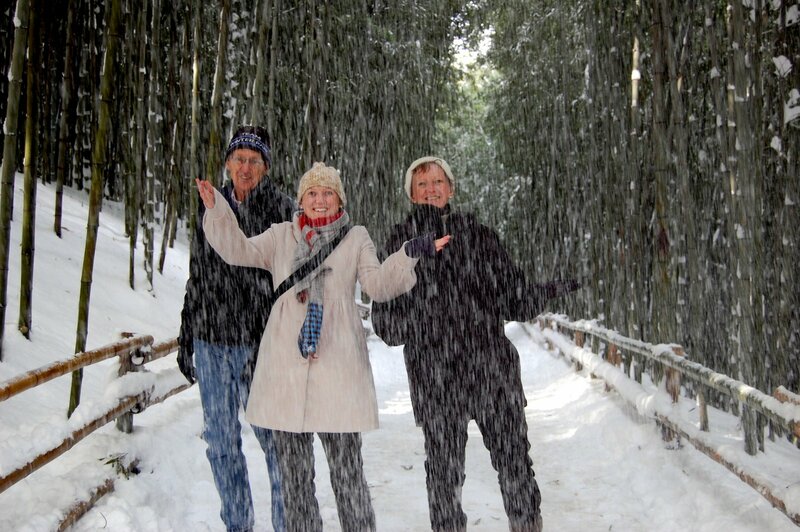 Next Post Snow pummels South Korea! Happy New Year from UtahI’m glad Deb and Terry enjoyed so much in Korea.I have a friend who live near you so I give your blog add.